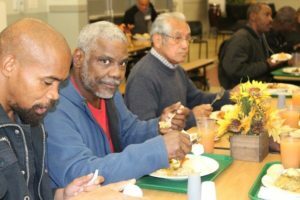 Washington, DC – For Thursday, November 23, 2017 – Central Union Mission is preparing to serve more than 2500 Thanksgiving meals to hungry and homeless people and families in Washington, DC, with the help of over 300 volunteers! Compassionate friends will be helping cook, setting tables, hosting and waiting tables for our two Thanksgiving seatings at 12:00 pm and 5:00 pm, as well as making sandwiches for those on the street and preparing the Mission for Christmas. In addition to turkey with all the traditional trimmings, Overnight Guests will be served and entertained by community volunteers. Thanksgiving food is purchased or donated by private friends, churches, offices and other groups. Media are invited. Please contact Deborah Chambers Deborah Chambers at 202-534-9965 cell or dchambers@missiondc.org to coordinate interviews with Mission, guests, volunteers and staff..